The barrage of alarming news articles has become almost endless, even as most of the overall media continues along in abject denial, at least as it concerns where all of these bizarre stories, both here and abroad, might be leading. In America, a preponderance of the population, understandably, appears to be caught up in a continuing anti-cultural war brought about by an irredeemable president seeking to foist his rather odd collection of 'philosophies' onto an entirely unamused society. It's the same president, by the way, who continually insists that Islam has nothing to do with the super-caliphate building ISIS jihadists. In Europe, that culture, as well, is under assault, as a dual-pronged thrust of fiendish multicultural globalists, on the one hand, & Islamic invaders on the other increasingly threaten the thin thread of rationality that's holding Europe together. It's the same Europe, point, in fact, that's increasingly insistent upon criminalizing citizens who speak ill of radical Islam. Pragmatically, Both America and Europe, together, represent the respective centers of world civilization and certainly the glue that holds global chaos in abatement. In troubled times such as these, at least in the past, it has been the Christian Church that has held society together, at least until a reckoning could be achieved. Now, in the modern age, the faith of Islam seems to be at the core of a new world order reassembly, and the cause appears to be the downfall of the West, at least as we know it. After the Roman empire fell, around 410 A.D. p, the vacuum that opened up left almost the entire known world at the mercy of marauding barbarians who terrorized and slay millions before some bit of sanity, many hundreds of years later, could be reconvened. In fact, it was only after Frankish General Charles "the Hammer" Martel, defeated the great jihad of the Umayyad Caliphate, in 732 in Northern France, that the way was paved for a European culture built upon the precepts of the Christian faith. In that time, between the fall of the Roman Empire and the rise of the Francs in Europe, the turn of the millennium teachings of Jesus Christ provided the underpinnings that would eventually lead a new civilization into being, both in Europe and across the planet. In fact, Christian King Charles Charlemagne 1st, who was Martel's great-great-grandson, would be the one whose cultural remake would eventually lead to the Renaissance period. However, now, the faith that forged a new civilization is being increasingly undermined by the forces of globalism and their newly forged militant arm, which can now be increasingly identified as Islam. 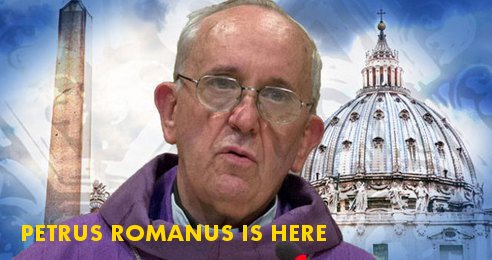 At the heart of this new Jihad, a new anti-leader has emerged and his name is Jorge Bergoglio, better known as Pope Francis, and he doesn't really have very much good to say about either modern civilization or the true faith of Christianity, ill-fittingly enough. Some biblical experts even refer to Francis as "The Last Pope" or Petrus Romanus, based upon the famed prophecies of St. Malachy, who correctly forecasted each Pope and even that Pope's particular namesake, all the way up through the last Pope, who not coincidentally, appears to be Pope Francis. However, Pope Francis' increasing notoriety has little to do with ancient prophecy and more to do with papal religious dictums, which have roiled the Church into a frenzy that's left a large number of both parishioners and non-Catholic Christians alike, questioning the leadership of a Church that seems to have lost its way, along with the rest of the world. Nevermind the fact that Francis was never supposed to have been selected as Pope, due to the fact that he was and is a Jesuit Preist. In explanation, Jesuits have been historically known as radicals,throughout Catholic history, and have constantly overstepped church bounds while challenging Catholic orthodoxy, amongst other issues. As a result, members of the Jesuit Order have been forbidden, by papal law, to reach the upper echelons of leadership within the Catholic Church. In fact, Francis is the first of his order to have reached the position of authority that is the Pope. Some have even referred to the Jesuit Order as the 'secret army' of the Catholic papacy "
"At the very top of their priorities has always been the destruction of Protestantism, as shall be seen. For the spiritual conflict must be discerned in all this: Satan’s ages-long war on the Church of the living God (Rev.12). For centuries, Rome has been the center of Satan’s assault on the saints of God"
The Church, at numerous points in history, has tried to wipe out its opposition through burnings at the stake and many other nefarious means. In the 1,500's the Church engaged in a prolonged effort to stamp out Martin Luther's Reformation Church, which eventually led the way towards the present day's non-Catholic Protestant faiths. All of this, in fact, lays the groundwork for where the Pope seems to be heading, now, when in a recent interview the Pope laid out a vision of Christ which, to many people, only confirmed that the world may be in an era both feared and hoped for, throughout human history. Pope Francis: "Today, I don’t think that there is a fear of Islam as such but of ISIS and its war of conquest, which is partly drawn from Islam. It is true that the idea of conquest is inherent in the soul of Islam. However, it is also possible to interpret the objective in Matthew’s Gospel, where Jesus sends his disciples to all nations, in terms of the same idea of conquest." The Pope's statement left little question as to the fact the leader of the modern-day Catholic Church, the Pope, actually criticized the words of Jesus Christ who Christians believe to be the 'Son of God,' and the exact reason for the Pope's existence. Christ never preached conquest, he did preach about spreading the good news, however, Pope Francis has deliberately walked into what many might term as blasphemy, in his customized papal misinterpretation of Christ's words. In fact, the Pope, not only directly questions the directive of Jesus's words, to 'preach unto all nations,' but he also questions the entire legitimacy of Christianity, itself, in comparing gospel bearing-Christians to the demonic, murderous, barbarians who call themselves ISIS. In effect, the Pope seems to have challenged God directly, which then leads us into all sorts of prophetical avenues, that most people would prefer to avoid. Aside from the Pope's avowal of the Global concepts of climate change and a centralized world government, to rule over all nations, the Pope has also questioned the legitimacy of free market capitalism. In fact, the Socialist Pope has repeatedly questioned the world's current economic system which could be more accurately described as mixed-market socialism, in favor of a new system of collectivism, which can only then be logically described as a form of Marxism or neo-fascism. But, this latest heretical point of view was only one in a series of miscues from the Pope that have led many to question their faith in the Catholic church. The Pope, while double-teaming with anti-Christian Obama, on a host of issues, has also even waged ideological war against Donald Trump, for his desire to build a border wall very similar to the border wall that surrounds the Pope's Vatican, in Rome, which is, in fact, a nation also. “You ask me if the God of the Christians forgives those who don’t believe and who don’t seek the faith. I start by saying – and this is the fundamental thing – that God’s mercy has no limits if you go to him with a sincere and contrite heart. The issue for those who do not believe in God is to obey their conscience. It is, simply put, the reason for the Catholic’s church founding and its subsequent spread throughout Christendom and the world, that those who believe in Christ will find both God and Heaven, however, the Pope does not espouse that particular belief, at all. It is further, in fact, the most basic of Christian precepts, that belief in Christ is the answer for humanity’s enduring salvation. By rejecting this most basic of precepts, the Catholic Church, via Pope Francis, is now executing a great leading away that may ultimately deliver a death-blow to the age of Catholicism as forewarned over 900 years ago by St. Malachy. 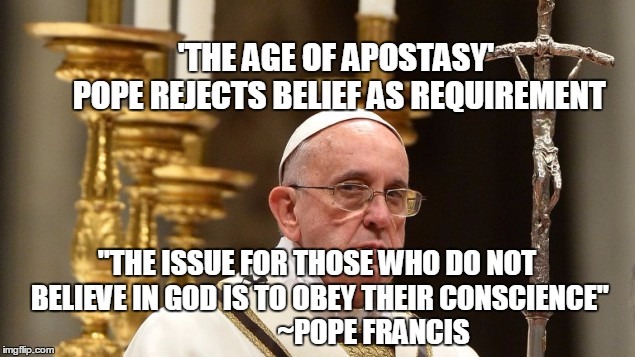 Moreover, it's not just the age of Catholicism, but rather, it seems more and more clear that the world may now have reached its forewarned age of apostasy. The Pope appears, now, to be redirecting the agenda of the Catholic church away from religious means and more towards global politics, in the form of social justice and redistribution. With a planet, now, increasingly stretching the boundaries of upheaval, with much more to come well across the board, we may be witnessing the beginning of a new paradigm, highlighted by repeated tribulation for mankind. What many see as this new paradigm may be heralding the beginning of a new age that only a few will faithfully recognize for what it actually is.